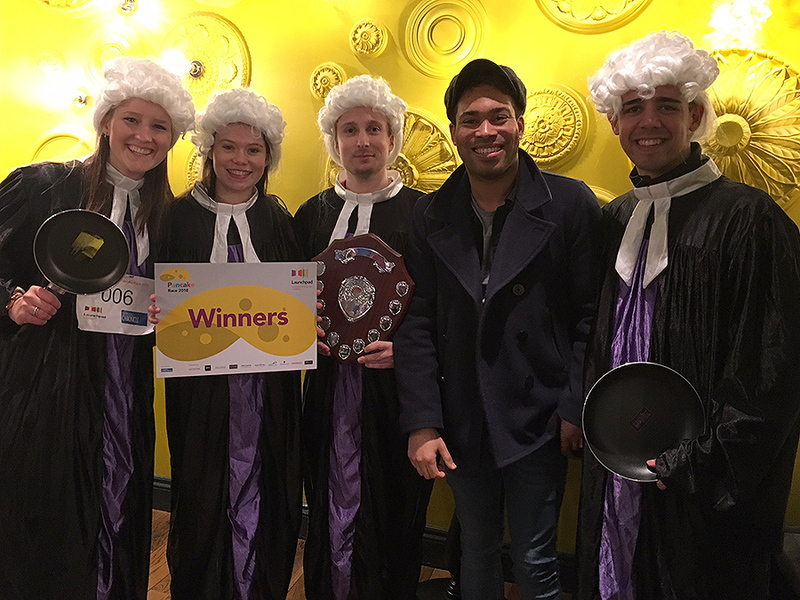 The annual Launchpad Reading pancake race is an eggstraordinary event that has been run on Broad Street for over 20 years. Teams from local businesses batter it out, egged on by cheering crowds. This year our Launchpad Pancake Race is on Shrove Tuesday, 5th March 2019. Teams from local businesses batter it out to win the coveted frying pan trophy at this eggstraordinary event! Why not get together with colleagues and enter a team of 4 in this fun lunchtime event? Not only will you raise money for Launchpad Reading but you will also have a chance to win some fantastic prizes. Your team will take part in a series of knock-out heats, tossing pancakes along the way. You’ll need to arrive in Broad Street Mall between 11.45am and 12.15pm for registration and team photos (for inclusion in Reading Chronicle’s coverage). We’ll then parade to Broad Street where races begin at 12.30pm with the award presentations at approximately 1.30pm. To enter, you’ll need to complete the application form along with a payment of £50 made payable to Launchpad Reading to secure your place. We’ll then contact you to confirm receipt of your entry and give you final details before race day. Places will be allocated on a first-come-first-served basis and one team per company is permitted. The deadline for applications is Tuesday 26 February. We are also looking for 10 volunteers to help us with registering teams on the day, bucket collecting during the event and, most crucially, ‘flip monitors’ to ensure all our teams are flipping their pancakes as they race! If you would like to get involved, please contact fundraising@launchpadreading.org.uk for more details. 2018 was a cracking year to race and this year promises to be no different!